September 13th Singing at the Shiloh Museum: It's time for the monthly reminder that the Shiloh Sacred Harp Singers of NW Arkansas will be singing in the General Store of the Shiloh Museum on Sunday afternoon, September 13, 2015 from 1:30 until 4:00 P.M. Visitors are always welcome, so come watch, tap your feet, look at the music in a loaner book while we're singing and join in the the singing. Photo: Bill Caldwell leads the Shiloh Singers at the August 9th singing in the Shiloh Museum General Store. Children, or "next generation singers," are also welcome to join in too. The fact is that our singing sessions are somewhat informal and you'll be surrounded by others who just enjoy singing the old songs as they were sung by our ancestors before small rural congregations could afford pianos and organs. Your participation is encouraged. Updated: 9/14/15 After the Singing Report - Had 25 adults and children at the singing plus the local cat who helped entertain the children. Just as the singing ended, a kitten of a similar color showed up at the open door but was afraid to come in. The children instinctively made a bee-line for the kitten who instinctively ran for the barn at full speed and was not seen again. It is wonderful to have children to attend and sing. We also had about several college students who were taking a music class and Andrew Albers and Bill Caldwell gave them some history and info on sacred harp and our type of singing. Hope they all make an A+ on their assignment. We were also joined by several singers from the Tulsa group planning their singing school and singing in Oct. 26th. September 26th Singing School and Sacred Harp Singing in Tulsa: But the monthly second Sunday singings are only just the start for the next two months. We're even more excited by the news that Sacred Harp singers in the Tulsa area have organized as Tulsa Friends of Sacred Harp Singing and they have planned a one-day Tulsa Shape Note School and Singing on Saturday, September 26, 2015 from 9:30 A.M. until 3:30 P.M. at the First Lutheran Church, 1244 S. Utica Ave. Dan Brittain will be leading the singing school. Thanks to Frank Christel for sharing the Facebook page link for more information about the Tulsa event at: https://www.facebook.com/events/1022825927749050/ and to Elaine King who is hosting the Tulsa group's new Facebook pages. Updated: 9/11/15 - We just got a note from Frank that the Tulsa group has posted their web page at: http://shapenoteoklahoma.org/ with info, slides and a YouTube video. Check it out. 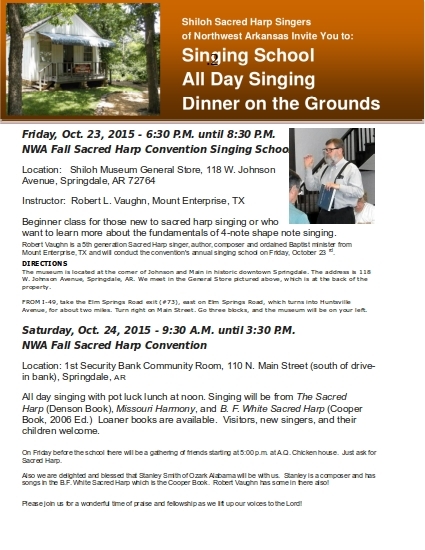 October 23rd and 24th NWA Fall Sacred Harp Singing School and Convention: We've already talked about the NW Arkansas Fall Sacred Harp Singing School on Friday evening, Oct. 23rd and the All-Day Singing Convention and Dinner on the Grounds on October 24th in Springdale. The singing school will be in the General Store, where we usually sing each month, from 6:30 to 8:30 P.M. The Saturday convention will be across the street from the Shiloh Museum entrance in the 1st Security Bank Community Room, just south of the drive in bank. The singing will start at 9:30 A.M. and conclude at 3:30 P.M. with a pot luck noon meal. Rather than repeat all of the details again in the newsletter, you can catch up with the details on last month's newsletter posting. 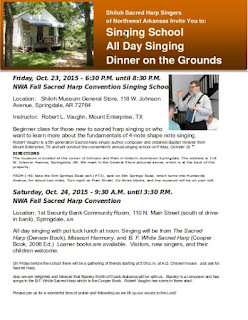 Thanks again to Elaine King's creative efforts on her computer, click on this link: NWA Singing School and Convention flyer for a PDF copy that you can easily view or download to print and share with others. Other Official and Unofficial activities: Updated: 9/11/15 - Thanks to Syd Caldwell for his note that Susan Young, Outreach Coordinator at the Shiloh Museum, will present a program on Sacred Harp at the Harrison Public Library on September 22, 2015 at 5:30 P.M.
As usual, any singers or visitors who wish to join the singer's table at AQ's Chicken House in Springdale for AQ's usual assortment of chicken dishes are welcome to arrive around noon this Sunday. Just ask the reception desk for directions to the singers and they'll point you in the right direction. It's a good time to visit and ask questions about Sacred Harp singing. ...And one more thing: We're still having headaches (program updates? regressions? driver error?) with our email and mailing list software. The September email newsletter was delayed while the mailing list was pieced back together yet again. While I hope the lists (two of them now) will stay fixed this time, we had to eliminate several damaged entries. IF you DID NOT get a copy of the September newsletter this month, and would like to get back on the list, please send an email to: brt.black@gmail.com so that we can make sure you are on the list. Of course if you got a copy and wish to just follow the news on this web site, directions for getting off the list are at the bottom of each newsletter. As always we'll look forward to singing with you on Sunday afternoon.